Versabar is a global leader in the development and application of heavy lifting solutions. The company specialises in engineered rigging systems, rigging rental and sale of proof-tested and certified lift components. 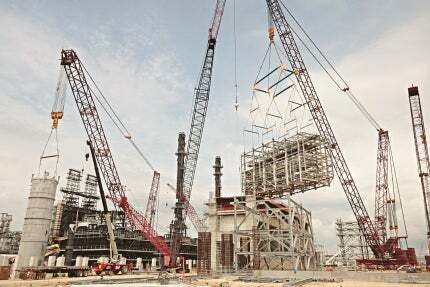 Versabar provides custom heavy lift solutions and integrated project management to clients worldwide, and is associated with accuracy, reliability and safety. Versabar manages lift projects of all sizes and scopes, working around any constraints that may come into play. Custom-engineered lifts often face a variety of challenges including limitations in hook-height, uncertain centres-of-gravity, an awkward lift location, acute time pressure, complicated rigging assemblies, or the need to integrate the actions of multiple cranes. Versabar has the broad expertise to anticipate such problems and deliver reliable lift procedures for complex lift projects. Versabar engineers and furnishes custom rigging systems designed to connect each lift package to the crane hook in a manner optimised to meet the project’s unique requirements. Through the use of determinate rigging systems, structural loads are minimised during lifting, offset centres-of-gravity are accommodated, and eccentric hook prong loads are equalised. Versabar’s extensive inventory of rigging equipment accommodates virtually any size lift with a reliable, cost-effective solution that is optimised for greatest efficiency at lowest overall rigging weight. All of the company’s lift components are proof-tested and certified. Custom rigging systems provided on a cost-effective rental basis from Versabar’s proof-tested and certified inventory save time and money while increasing safety margins. Versabar optimises custom rigging packages to meet clients’ specific needs, sometimes combining rental equipment with purchased rigging. Versabar pioneered the first systematic weighing programme in the construction industry, and continues to lead the field in the number and diversity of packages it weighs on an annual basis. The company’s weight reports calculate the weight and centre-of-gravity with an accuracy of +/- 1%. Using this data, rigging engineers calculate precise sling and spreader bar lengths to ensure a safe and level lift. Versabar’s weighing division uses calibrated electronic load cells, hydraulic jacks, and proven field practices to accurately and reliably determine the weight and centre-of-gravity of structures from 1t to 12,000t. Performing a lift of any size is a complex operation involving considerable planning and preparation along with professional engineering and execution. Versabar’s integrated lift management approach encompasses all aspects necessary for lift operations to be conducted safely and projects to be completed on schedule. This includes gathering accurate weight and centre-of-gravity measurements, delivering a professionally engineered lift plan with verified lift points, providing certified and proof-tested rigging equipment, supplying drawings, documents, and qualified lift supervisors onsite, and taking any steps necessary to mitigate risk factors. Having managed more than 100,000 lift projects, Versabar understands the demand for smooth coordination of services and a timely resolution of variables in preparing for and executing a lift project. By implementing in-house solutions, the company provides an integrated service that is efficient and reliable. Versabar was founded in 1981 with the invention of the industry’s first reusable spreader bar, called the Versabar. They company’s foundations were in renting and leasing engineered rigging systems. With more than 30 years of lift experience, the company has grown to add weighing and testing divisions, expand its rigging inventory, and extend its worldwide reach. Versabar has furnished certified, customised rigging systems to accomplish more than 100,000 lifts on six continents. The company’s client list includes oil and gas producers, as well as refineries, shipyards, fabricators, construction companies, government agencies, offshore contractors and universities. Versabar is based in Houston, Texas, and New Orleans, Louisiana, US. Versabar provided lift engineering and custom rigging in order to lift the full-size Nasa space shuttle replica, Independence, and mount it atop Nasa 905, a Boeing 747 shuttle carrier aircraft (SCA), in the creation of a new world-class aviation exhibit, Independence Plaza. Versabar provided lift engineering and rigging to install a 358,500lb exchange structure at a refinery. Versabar provided custom engineering and rigging to aid in the construction of new storage silos in the Port of Gulfport, Mississippi, US. Versabar's VersaCutter received the 2015 Woelfel Best Mechanical Engineering Achievement Award at the Offshore Technology Conference held in Houston, Texas, US.